Leamington’s railway station car park will be filled with 212 homes after a major plan for affordable flats and new houses gained unanimous support from councillors. But residents fear the build on the 300-space car park and land around it could create a “ghetto” and - with flat blocks being up to five storeys high - invade on privacy and safety. Plans for the major housing development off Station Approach were approved by Warwick District Council planners on Tuesday despite 20 objections from residents. The build by Waterloo Housing will be made up of 118 flats and 94 houses, 75 per cent of which will be affordable. 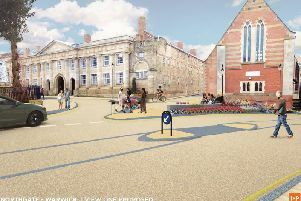 Urging councillors to approve plans, planning officers described it as a “really important, innovative and exciting scheme” which had been many years in the making. Objecting against the “domineering development” on Tuesday, one Avenue Road resident said: “There is an incredibly high affordable housing percentage here. Parking issues raised by seven objectors and councillors were dismissed after reports from highways officers stated that the number of cars in the area would not significantly increase. As part of the brownfield site redevelopment, public parking will reduce to 100 spaces and the bus depot and sales lot will be demolished. The council will provide a further 43 spaces on Lower Station Approach. Chiltern Railways, which operates services from Leamington, has objected to the loss of the current car park but a council officer said that “it was always the intention” to redevelop the site with planning permission granted for a large parking site to the south of the station on the Travis Perkins site. This matter is being discussed by the developers, Chiltern Railways and Network Rail. Of the 212 homes, 85 will be for affordable rent, and 75 to be sold under shared ownership. The remaining 52 will be available for general sale. Disabled access onto Park Drive will be looked into after concerns were raised over suitability for push chairs and wheelchair users.